Sparkling lyricism, vivid instrumentation, and impressive thematic development characterize both these popular works, reprinted here from from the authoritative Breitkopf & Härtel edition. 96pp. 5 3/8" x 8". 40643-1. Our price: $5.95 + $10 shipping for first item, others $6 each. Delivery in 3-5 days by Global priority mail, or in 5-7 days by Airmail. Our price: $19.94 + $10 shipping for first item, others $6 each. Among his most popular compositions, Schubert's Fourth Symphony is especially known for the grave beauty of its slow movement. And, like many of his early works, the Fourth contains traces of Haydn, Mozart, Beethoven, and Rossini. Poetically conceived and subjectively emotional in the romantic manner, however, the symphony also possesses an individuality which is pure Schubert. The work is reproduced here from the authoritative Breitkopf and Härtel edition, complete with bar-numbered movements for easy reference. As a conveniently sized miniature score, it is sure to be welcomed by students, musicians, and music lovers. Unabridged republication of a selection from Series 1 (1884-1885) of Franz Schubert's Werke. Kritisch durchgesehene Gesammtausgabe, published by Breitkopf and Härtel, n.d.	64pp. 6 1/8" x 8 1/2". 42135X. Our price: $13.94 + $10 shipping for first item, others $6 each. 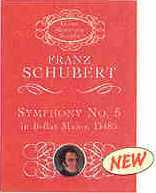 Miniature score version of Schubert's Fifth Symphony released in June 2000. 64pp. 6 1/8" x 8 1/2". 41175-3. Our price: $3.50 + $10 shipping for first item, others $6 each. Delivery in 3-5 days by Global priority mail, or in 5-7 days by Airmail (Printed Matter). Our price: $11.49 + $10 shipping for first item, others $6 each. The rhythmic vitality and lyric beauty of Schubert's "Unfinished" Symphony and his last symphonic creation appear in full score in a portable, inexpensive, high-quality edition. Ideal for students and concert-goers. 160pp. 5 3/8" x 8". 29923-6. Our price: $6.95 + $10 shipping for first item, others $6 each. Our price: $20.94 + $10 shipping for first item, others $6 each.